Perfect for making frothed milk, the CDN IRT220-F ProAccurate® Insta-Read® Beverage and Frothing Thermometer is a great addition to any kitchen. This thermometer reads temperatures up to 220 degrees Fahrenheit. To quickly read temperatures in between tasks, this NSF approved thermometer is equipped with a magnified dial display with polycarbonate lens. Thanks to its target range indicator, you can easily determine whether milk is steamed to prime frothing temperature. Designed with durability in mind, this shatterproof thermometer has a rust-resistant stainless steel housing and comes with an ABS plastic sheath with BioCote®. 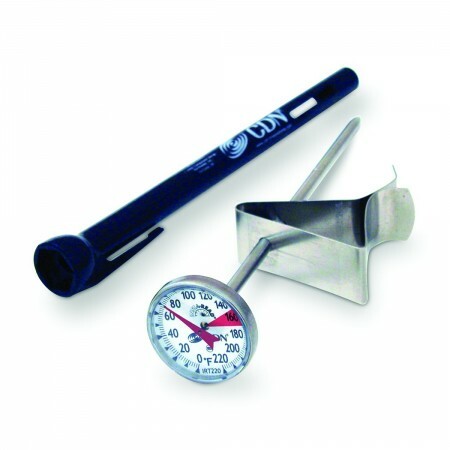 Dimensions: 8-9/10" x 4-1/2" x 1-1/5"
$2.58 Winco TMT-FT1 Frothing Thermometer 1"